And Greater Manchester Passenger Transport Authority thinks so too! Free adult cycle lessons are available. If you’re not confident on your bike on the road then this is for you. It’s for Adults (16+) who live or work in Greater Manchester. Well worth a look. I used to cycle to my old allotment but used as few roads as possible! I used to use the canal towpath and the cycle paths where possible. Ever thought about solar panels? Solar panels create electricity from the sun. I have them on my house. I’ve had them two and a half years. Every day when I see them during the day I smile and know that they are generating electricity. With the best savings accounts paying only 3-4 interest its not surprising The Sunday Times listed Solar Panels as one of the Top 5 Investments for your Savings. The Government plans to reduce the rate of the Feed in Tariff for future installations so its important you dont delay, request your FREE QUOTE today. Slug poison was found in one in eight rivers and reservoirs used for drinking water in England and Wales according to the Environment Agency’s (EA) most recent survey, prompting environmentalists to call for greater use of natural predators instead of chemicals. Bin bags and household bins. How many of you think you are recycling plastic bags when you use them once as a rubbish bag to contain waste from your kitchen (Or other household bins) to the actual bin? Unless your council is forcing you to put out bin bags still, you don’t need to wrap your rubbish in plastic to put it inside another bin. Think about how many carrier bags you use a week to line bins? Assume you empty bins once a week and you have three bins then that’s 150 carrier bags you are sending to the tip. If you have a wicker bin then you might not want to put anything wet or food waste into it – but I’d recommend you don’t put nasty stuff straight into the bin anyway. Rinse out meat trays and leave them to drain before throwing them away. If you have food waste then harass your local council until you have a food waste collection. Your kitchen bin is probably a sturdy plastic container that has no holes in the bottom. This is perfectly suitable for using as a bin without the addition of a liner. Stop wasting plastic bags – put your rubbish straight into a bin and then empty this in to your wheely bin without wasting hundreds of plastic bags a year. 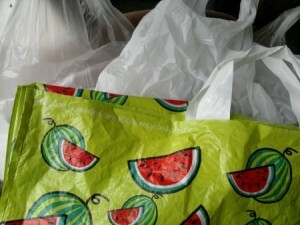 Reuse plastic bags by using them as bags for carrying things back from the shop. Don’t be afraid of asking people to not give you a bag – take your own and pack your own stuff into a bag you’re reusing. Please don’t waste carrier bags and bin liners by sending them to landfill. If we all stop doing this then we will be massively reducing the amount of landfill waste we have. If you end up with a huge bag of carriers at home then you need to start taking some back out with you when you’re shopping. If I don’t have enough bags out with me when I am shopping then I ask for a cardboard box. These have plenty of uses in my house – for collecting up items for sending to the local jumble sale, for storage of items and for using on my allotment as weed suppressant. Fold up bags neatly and put some in your everyday bag or coat. Once you get into the habit you’ll realise just how many bags you’ve been wasting over the years. Our local supermarket has a proper carrier bag recycling container too – this means they get turned into something useful rather than ending up in landfill. Please share this blog post with your friends and on facebook to spread the word about not wasting plastic bags!